Guy Standing (born 9 February 1948) is a British professor of Development Studies at the School of Oriental and African Studies (SOAS), University of London, and helped start Basic Income Earth Network (BIEN). Standing has written about labour economics, unemployment, and other areas. His writing now is about basic income and democracy. He wrote the book The Precariat: The New Dangerous Class in 2011. Fellow of the Academy of Social Sciences (FAcSS). ↑ "Professor Guy Standing, Department of Development Studies". School of Oriental and African Studies (SOAS), University of London. Retrieved 5 July 2014. ↑ Standing, Guy (27 January 2012). "The precariat: why it needs deliberative democracy". openDemocracy. http://www.opendemocracy.net/guy-standing/precariat-why-it-needs-deliberative-democracy. Retrieved 4 July 2014. ↑ Standing, Guy (2011). The precariat. City: Bloomsbury Academic. ISBN 978-1-84966-455-4. ↑ "Fellows". Academy of Social Sciences. Retrieved 5 July 2014. 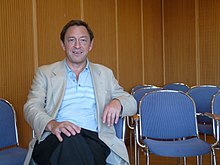 Wikimedia Commons has media related to Guy Standing (economist). This page was last changed on 2 April 2019, at 19:45.